I am an adult and I like marmalade. I am an adult and I also like dark chocolate and espresso coffee. I am an adult and I can say no thanks to steamed fresh beetroot, purple cabbage and offal…and I like that I can say no. I every time I take a bit of this delicious marmalade, it screams to me I am an adult. Why? As The Monkeys don’t like it and it’s all for me. Last time my dad came to visit, he brought a bag full of fresh cumquats. This was a fruit that I hadn’t tried before but knew it was frequently used in marmalades. Did a little reading, researching and then tasting (souRRR!) 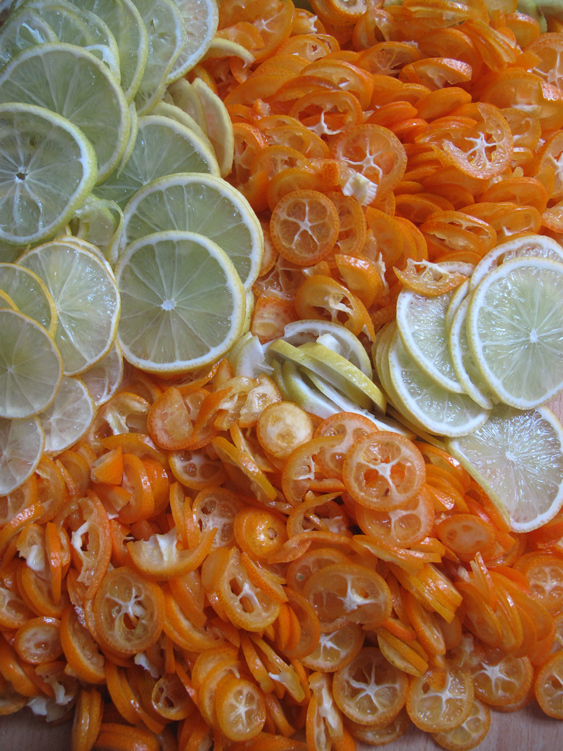 There wasn’t enough to do only cumquat marmalade but lucky for me my dad had also brought a whole lot of huge limes from his tree. So Cumquat and Lime it was. Finely slicing up all the fruit and reserving all seeds from the cumquats. Seeds were soaked in 1 cup of water overnight and sliced fruit covered in water and also soaked over night. The next day looking at my little bowl of seeds and water I was absolutely thrilled to see all the pectin had oozed out. A clear gelatinous little bowl full that gets cooked up in the marmalade, (ditching the seeds of course.) Sugar added. Cook it up and ready when a small saucer has been placed in the freezer, and a spoonful of the marmalade sets when placed on the cold saucer. This entry was posted in Food Glorious Food and tagged canning, cumquat and lime marmalade, food, preserves, recipes by cityhippyfarmgirl. Bookmark the permalink. oh good, I thought I was the only one that thought it was quite funny to watch my little ones try something sour and get whole body shudders…evil. oh I like that song! Great pics these, well done. And your right, this marmalade would not be for the faint hearted. Thanks Celia and Anna. Cumquat jelly sounds good! Good for you you you. I can only imagine what it tastes like as have never had cumquats, but it looks good on the spoon and tastes good in my head. And fancy have a dad bringing bags of limes from his lime tree – how wonderful is that. I love it when he brings limes down, always big and super juicy. The marmalade did set really well, and it really does taste delicious. I still marvel at the consistency when it catches the light. Evil is lovely. Kids need to be shown evil so they can be your fellow-evil when they grow up… nice work. Really. The cumquat was sour. The ones on our tree must be a different variety. I can eat them straight from the tree and they are surprisingly good. Not sour at all. 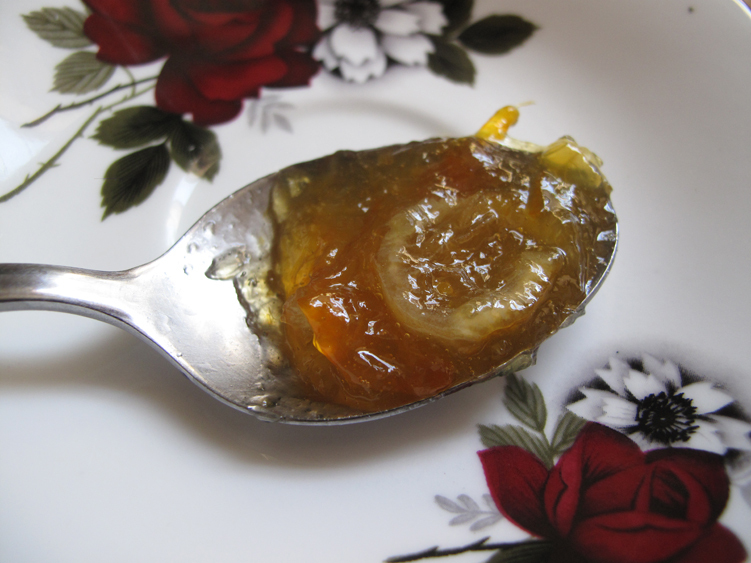 I used to frequently make a cumquat marmalade every winter till the fruit began to go funny. It’s been full of grubs for the last two years. Such a shame. Never thought to put lime with it.